I love the rhythm of humdrum weekends. The kind when nothing remarkable is happening save for the ebb and flow of family life. While it may feel like little is going on, the space and time for slow cooking and family meals is more than enough to satisfy me. I could happily have a roast dinner every weekend of the year and never grow tired. But in hot weather even my insatiable appetite for a roast craves something lighter. 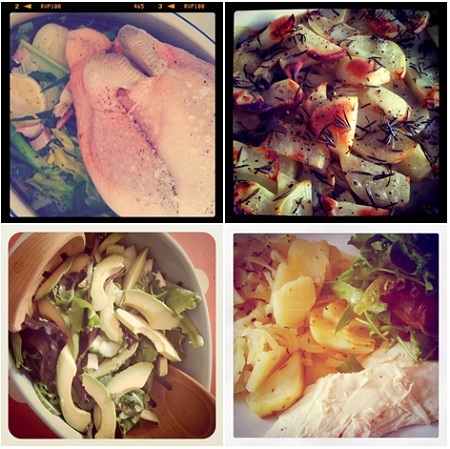 Recently we have been having our roast chicken with green salad and boulangère potatoes. It fits with my current need for hands off cooking but provides a deeply satisfying meal at the end. Butter a shallow oven proof dish. Layer the potatoes and onions alternately, lightly seasoning with pepper and the herb as you go (a word of caution here, too much pepper will make the dish hot). Finish with a layer of potatoes, pour pour over the hot stock until it reaches the top layer of potatoes. Dot butter over the top of the potatoes. Bake in the oven at 180°C for 60 – 70 minutes until the top is beginning to colour and crisp a little. Serve at the table with fresh green salad. Fantastic with roast chicken, poached chicken, grilled fish or even leftovers to name but a few. Thanks Kat, will be trying these as soon as I get a chance, they look delish! I love potatoes so much. Will definitely be trying this and your poached chicken soon. Your pictures are making me so hungry! I’ll bet you’re feeling hungry with Miss Kate to look after! I couldn’t agree more…an at home weekend with family is priceless. Your cooking looks delicious! Hmmmm another of your scrummies I need to try lady! Yum! Oooh, glad you enjoyed it! I want to come over for dinner please. MMMMM…those look so good! You’d have to stay all weekend but sure, you can come. These potatoes look awesome! I am really glad that I found your blog!! I wanted to stop by and say congratulations for making it through to the final of the MADS, I will be voting for you!!!!!!!!!!!!!!!!!!!!!!!! I think I know this one! 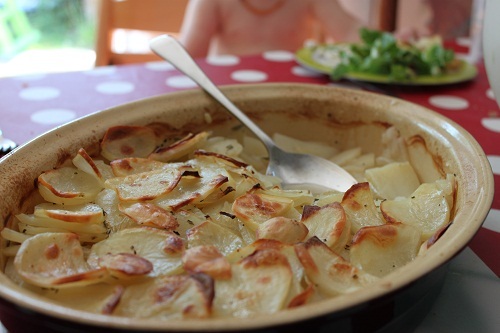 Au gratin is with: a cheese sauce and topped with crumb, dauphinoise is is with: cream and garlic and boulangere are with: stock. Al baked, all extremely good!